One of Indiana’s most celebrated sons, John Mellencamp’s music has become a byword for blue-collar authenticity, literate songwriting and heartland rock verity. His lucid style enabled him to crossover during the 1980s from an established cult figure with a fanatical following to a somewhat more mainstream entertainer and eventually a superstar in his field, though he hasn’t actively sought out the shallower end of fame and concentrates on his work regardless of whatever fad and fashion is around at the time. From 1982 on he enjoyed a string of hit singles, including “Hurts So Good”, the signature piece “Jack and Diane”, “Crumblin’ Down”, “Small Town”, “R.O.C.K in the U.S.A.” and “Cherry Bomb”. His album sales flourished exponentially and he has moved over 40 million discs while hitting the Top 40 in America 22 times. His successes include the fact that he has had more number-one on the Hot Mainstream Rock Tracks chart, seven, than any other artist and he is a Grammy winner to boot with 13 nominations. His most recent disc is Plain Spoken, which does what it says on the cover and has garnered enthusiastic reviews to match a career where maturity and craft are a byword. Alongside Willie Nelson, Bob Dylan and Neil Young, Mellencamp is one of the founders of the influential Farm Aid organisation, a more American grass-roots answer to Band Aid. An inductee into the Rock and Roll Hall of Fame (2008) his combination of liberal protest music, partially derived from the likes of Dylan and Woody Guthrie, rock and soul has been expanded across the years to encompass rural instrumentation and what he calls a ‘raw Appalachian’ sensibility. His habit is to address social realism head on rather than wallow in nostalgia or escapism for their own sake. He seems to be at the peak of his powers right now and that is testimony to his enduring appeal. After a difficult childhood when he recovered from spina bifida, Mellencamp immersed himself in pop music as a teenager. His earliest influences were Anglo inspired and he became something of an expert on the British glam rock movement with particular regard to Roxy Music and David Bowie, enabling him to be viewed as a trailblazer in otherwise conservative Indiana circles where country and old school rock were perhaps more the norm. After touting his wares across the New York record business John fell in with Bowie’s MainMan manager Tony DeFries and the Englishman swiftly signed him to a deal while insisting that he adopt a stage name, Johnny Cougar, and sport a US version of high camp glam with make-up. The resulting debut, Chestnut Street Incident, had an air of Bruce Springsteen around the edges but the following album, The Kid Inside, was rejected by DeFries (though he released it in 1983 once Mellencamp had made his name). Maintaining the English connection, John fell into the clutches of Rod Stewart’s management guru Billy Gaff and spent his time commuting between London and the States without great results. The London-recorded A Biography and the starker John Cougar were his last efforts in the 1970’s – the latter spawning a hit for Pat Benatar in “I Need a Lover”. Feeling cut adrift from his roots, Mellencamp returned with the Steve Cropper-produced Nothin’ Matters and What If It Did, but still didn’t find fulfillment as an artist. We pick his story up again with American Fool, where he is still called John Cougar but is developing his own voice and style with producer Don Gehman (Stephen Stills, R.E.M., Hunters and Collectors and others) and people suddenly sat up and took notice. This album features the playing skills of one Mick Ronson, as well as the rock solid rhythm section of Kenny Aronoff and George ‘Chocolate’ Perry. American Fool is a breakthrough in that the best songs have a narrative strength, which will become our man’s calling card. “Jack & Diane”, largely arranged by Ronson (the pair had worked together on and off in the early days); “Hurts So Good” and “Hard to Hold On To” had a grace and depth that retain their allure now. Amazingly too, after years of struggle this is the album that shoots John into the public consciousness since it became the best-selling disc of the year and took him to the coveted top slot on Billboard’s Top 200. We totally recommend this outing, one that also comes in remastered format with the extra track, the title song itself. 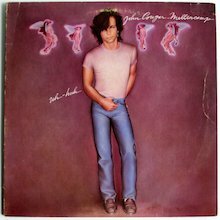 After The Kid Inside finally sees the light of day in 1983 the real John Cougar Mellencamp stands up to be counted on the fine Uh-Huh, another smash and one of the greatest albums of an era not known for classic albums. Again the hits helped – “Crumblin’ Down” deals with fame and the aftermath, “Pink Houses” is a delightful snapshot of a moment in time and “Authority Song” finds Mellencamp widening his angles. Incidentally some of the backing singing here comes from Spirit’s Jay Ferguson and the main players will become John’s stage group. The new straight-talking approach paid dividends and John finds himself with an audience who want to hear what he’s got to say, and that’s plenty. Again there is a remastered version with the extra bonus of an acoustic “Pink Houses” that captures the original intent well. Now able to shed the last vestiges of his pretty boy image – though he is a handsome fellow for sure – JCM returns to Indiana to record the sublime Scarecrow set where a more rugged and rootsy approach shines bright on “Small Town”, “Lonely Ol’ Night” and the bittersweet anthem “R.O.C.K. in the U.S.A. (A Salute to 60’s Rock)”. Check out the remastered 2005 version for more goodies. In1987 The Lonesome Jubilee was born from a stack of nose-to-the-grindstone rehearsals and introduced John’s following to the artist’s desire to use heartland instrumentation and specialists like Lisa Germano (fiddle) while allowing long time collaborator Larry Crane scope to add neat sounds conjured on autoharp, banjo, mandolin. A real down home treat is this and his most critically acclaimed release at that point. Finally critics started to get the point: John could make credible music that didn’t pander to the mainstream but enriched the medium as the remastered version of bonus cut “Blues from the Front Porch” amply demonstrates. Big Daddy (1989) is self-produced and maintains the folkier elements while fusing a darker lyrical stance than he’s attempted before. But there’s light and shade, not least in the inclusion of a cover of The Hombres’ 1967 classic garage Dylan/hippy parody “Let It Out (Let It All Hang Out)” and the deeply felt “Mansions In Heaven”. This album repays reinvestigation 25 years later. It’s often overlooked but should not be. 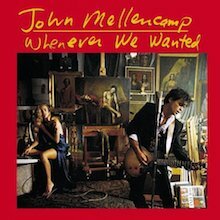 Whenever We Wanted (1991) is the first album released as plain John Mellencamp and the move towards hard rock punch with a light pop sensibility singles this out as another milestone. Human Wheels shifts the man’s stance further away from the norm via “When Jesus Left Birmingham” – one of his greatest achievements – and the lovely “Suzanne and the Jewels” where the addition of Malcolm Burn’s ambient keyboards add extra lush textures to the sonic palette. It may be many folks favourite Mellencamp moment but there are plenty of others to draw the listener in that are as good. The deliberately radio-friendly Dance Naked (1994) was the swiftly accomplished follow-up and features a neat cover of Van Morrison’s “Wild Night” (the opening track on the latter’s lovely Tupelo Honey) where Me’Shell Ndgeocello adds her considerable bass guitar and vocal clout to proceedings. Mr. Happy Go Lucky closes out a chapter in 1996. Recorded after he suffered a minor heart attack, he deals with encroaching middle age with wit and humour and no little pathos too on “This May Not Be The End Of The World” where a small town scenario takes on apocalyptic significance – a marvelous, defining song that graces a really strong suite of Mellencamp at his considered best. The Best That I Could Do 1978-1988 – typically self-deprecating title – is of course an anthology of good stuff that traces beginnings at Riva Records through to the initial heyday. Of extra interest is his cover of the eclectic track “Without Expression”, penned by Terry Reid and Graham Nash. A classy addition. Add to this one the mostly acoustic collection Rough Harvest, a tying up of loose ends with nods to Dylan’s “Farewell Angelina” and the bonus “Seventh Son” and a vibed up assault on The Drifters’ “Under the Boardwalk”: again this one slipped through the net - unless you’re a diehard fan - but anyone becoming acquainted with Mellencamp now will enjoy this rootsy epic set. Words & Music: Greatest Hits is just that but is also an esoteric collection with many surprises spread over 2-discs. The 2007 offering Freedom’s Road moves him on apace with a 1960’s feeling adapted to modern technology - since John is no Luddite but rather a lover of honest sound. Joan Baez guests on “Jim Crow” and the American country band Little Big Town enhance matters with some lovely harmonies. Life, Death, Love and Freedom has a portentous title but Mellencamp doesn’t mind that as he views it to be up with his best work and we don’t disagree. His entire dedication to heartland music is all over the songs and producer T Bone Burnett adds appropriate gravitas to the sound, using the pioneering CODE process. Life, Death, Live and Freedom is the companion piece –featuring eight live versions of the parent disc recorded in Toronto, Philadelphia and Los Angeles with an appropriately stripped back acoustic feel that brings out all the majesty of the songwriting. 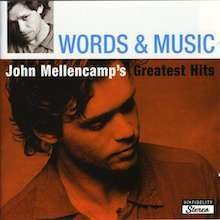 Evidently on a roots roll now, Mellencamp’s most recent discs are No Better Than This, recorded with Burnett at historic landmark American sites like Sun Studio, the First African Baptist Church, Savannah, GA and the Gunter Hotel in San Antonio, Texas where blues legend Robert Johnson holed up to write in 1936. A mouth watering and important disc, this encourages John to provide some of his finest acoustic guitar playing abetted by T Bone’s own prowess and the masterful Marc Ribot. Needless to say No Better Than This won major plaudits and if it’s too early to say it’s a durable masterpiece just yet, we wager it will be viewed as such soon. In keeping with the country blues theme Trouble No More Live at Town Hall (2014 – New York City Town Hall) situates originals alongside Dylan, Guthrie, Son House and Hank Williams. The most recent Plain Spoken confirms a talent in full spate with Burnett seemingly part of the fixtures and fittings and everything in order in John Mellencamp’s world. Those who wish to explore further should check up on the box set On the Rural Route 7609 where a 4-CD set finds ample space for writing demos, left-field spoken word interpretations and so many rarities that it truly is an essential addition to the Mellencamp world, a real cornerstone event and a homage to Indiana. A storytelling giant then whose music arrives like sepia tinted snapshots of real America rather than the plastic version, John Mellencamp goes from strength to strength. Dig in and fill your cowboy boots. There is music to savour for all time here. 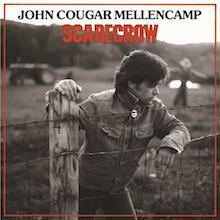 Uh-Huh found John Mellencamp coming into his own, but he perfected his heartland rock with Scarecrow. A loose concept album about lost innocence and the crumbling of small-town America, Scarecrow says as much with its tough rock and gentle folk-rock as it does with its lyrics, which remain a weak point for Mellencamp. Nevertheless, his writing has never been more powerful: "Rain on the Scarecrow" and "Small Town" capture the hopes and fears of Middle America, while "Lonely Ol' Night" and "Rumbleseat" effortlessly convey the desperate loneliness of being stuck in a dead-end life. Those four songs form the core of the album, and while the rest of the album isn't quite as strong, that's only a relative term, since it's filled with lean hooks and powerful, economical playing that make Scarecrow one of the definitive blue-collar rock albums of the mid-'80s. John Mellencamp's fascination with the American heartland came into full flower on Scarecrow, but with its follow-up, The Lonesome Jubilee, he began exploring American folk musics, adding fiddle, accordions, and acoustic guitars to his band, which allowed him to explore folk and country. The expansion of his band coincided with his continuing growth as a songwriter. 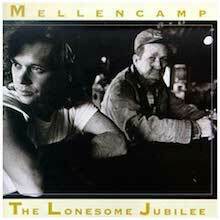 Song for song, The Lonesome Jubilee is Mellencamp's strongest album, the record where he captured his romantic, if decidedly melancholy, vision of working-class America. He may recycle the same lyrical ideas as before, but he captures them better than ever, and his music is richer, which gives the album resonance. Again, there are a few moments where Mellencamp's reach exceeds his grasp, but "Paper in Fire," "Check It Out," "Cherry Bomb," "Empty Hands," and "Hard Times for an Honest Man" make the record his best. Since American Fool illustrated that John Cougar was becoming an actual songwriter, it's only proper that he reclaimed his actual last name, Mellencamp, for the follow-up, Uh-Huh. After all, now that he had success, he wanted to be taken seriously, and Uh-Huh reflects that in its portraits of brokenhearted life in the Midwest and its rumbling undercurrent of despair. Although his lyrics still have the tendency to be a little too vague, they are more effective here than ever before, as is his music; he might not have changed his style at all -- it's still a fusion of the Stones and Springsteen -- except that he now knows how to make it his own. Uh-Huh runs out of steam toward the end, but the first half -- with the dynamic rocker "Crumblin' Down," his best protest song, "Pink Houses," the punky "Authority Song," the melancholy "Warmer Place to Sleep," and the garage rocker "Play Guitar" -- makes the record his first terrific album. 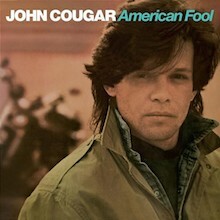 John Cougar's first albums were so bereaved of strong material that the lean swagger of American Fool came as a shock. The difference is evident from the opening song, "Hurts So Good," a hard, Stonesy rocker with an irresistibly sleazy hook. Cougar never wrote anything as catchy as this before, nor had his romantic vision of small-town America resonated like it did on "Jack & Diane," a minor and remarkably affecting sketch of dead-end romance. These two songs are the only true keepers on American Fool, but the rest of the record works better than his previous material because his band is tighter than ever before, making his weaker moments convincing. Besides, songs like "Hand to Hold On To" and "China Girl," for all their faults, do indicate that his sense of craft is improving considerably. John Mellencamp responded to his massive heart attack and close-call with death with Mr. Happy Go Lucky, the most overtly ambitious album in his career. Mellencamp has always been a bit of a fatalist, so it isn't any great surprise that there is an undercurrent of dark mortality running through most of his songs. What is a surprise is his musical approach. Although he hasn't abandoned the essential elements of his music -- the rootsy instrumentation, the violins, the simple song structures, the gritty folk-rock -- he has augmented it with the help of Junior Vasquez, a noted dance producer. Vasquez doesn't push Mellencamp into dance, but he adds certain dynamics and techniques from club music to Mr. Happy Go Lucky which ocasionally gives the album a greater depth. It's a gentle change, not a forceful one -- nothing sounds like dance music, but there are deeper rhythms and bass throughout the album, which breathes life into well-crafted songs like "Key West Intermezzo." Since he doesn't pursue dance completely on Mr. Happy Go Lucky, Mellencamp doesn't end up alienating his fans, but the reluctance to give himself over to dance makes the album uneven. Ironically, the tracks that exhibit Vasquez's influence the least are the least successful -- they simply sound like Mellencamp is going through the motions. Nevertheless, Mr. Happy Go Lucky proves that Mellencamp has more surprises in him than many listeners would have expected and suggests that he is in the process of revitalizing his career. John Mellencamp is nearly the Rodney Dangerfield of rock & roll, getting no respect no matter how much he may deserve it. Throughout the '90s, Mellencamp essentially worked away from the spotlight, crafting a series of solid records without anyone paying attention. He had the occasional hit -- a cover of Van Morrison's "Wild Night," the subtly insistent "Key West Intermizzo (I Saw You First)" -- but he was no longer part of the rock critic discourse the way he was in the '80s with Scarecrow and The Lonesome Jubilee. 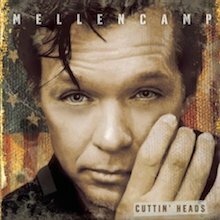 Such neglect actually helped Mellencamp grow, as his 2001 effort, Cuttin' Heads, proves. 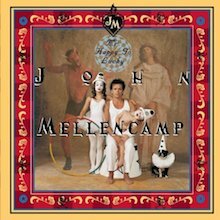 This may not be a record that brings chart success, or even critical acclaim, but it does find Mellencamp at a kind of peak, turning out vividly socially conscious roots rock that works not because of the message, but because the music is seductive and sinewy enough to deliver the message. The grooves and riffs are earthy, so much so that when Chuck D drops a rap at the bridge in the title track, it seems natural, not forced; similarly, India.Arie's presence on "Peaceful World" enhances the plea for understanding at the core of the album, instead of distracting from it, and it feels as right as Trisha Yearwood's duet on "Deep Blue Heart." Ultimately, this is a record of small, subtle triumphs, but they are triumphs all the same, finding Mellencamp crafting music that's earthy yet succeeds because of the small details. It's a laid-back record -- even when it rocks hard, it rocks like a bunch of guys having fun on a back porch on a Saturday afternoon -- but that's its charm, since it's natural, real, and unassuming: in short, the kind of record Mellencamp's been trying to make since he shed the Johnny Cougar tag. No, there aren't songs as undeniable as "Lonely Ol' Night" or "Rumble Seat," but there are no slow stretches and it's a true testament to his talents as a craftsman, which is more than enough. John Mellencamp took his signature blend of Stonesy rock and folk as far as it could go on Big Daddy, so he wisely returned to straight-ahead rock & roll with Whenever We Wanted. Uh-Huh was the last record he made that rocked as hard and consistently as this, and his songwriting had improved considerably in the years since that breakthrough release. Which means, of course, that Whenever We Wanted is more consistent than the earlier record, but it never reaches the highs of Uh-Huh. Even its best moments ("Love and Happiness," "Get a Leg Up," "Whenever We Wanted," "Again Tonight") shine because of their craftsmanship, failing to achieve the kinetic energy of his earlier work. Whenever We Wanted remains a solid record, but it's one that feels like a holding pattern. 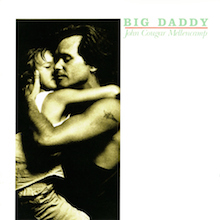 Continuing with the folk inclinations of The Lonesome Jubilee, John Mellencamp recorded his most ambitious and serious-minded album with Big Daddy. Mellencamp produced the record himself, giving the album a concise and stripped-down sound, which help give his songs the appearance of being gritty statements of truth. Unfortunately, Mellencamp isn't saying nearly as much as he believes he is, since his lyrics tend to be clichéd and half-baked, making much of the album feel pompous and self-serving. This is only reinforced by the lack of rockers on Big Daddy, since he saves the most carefree moment -- a ripping cover of the Hombres' "Let It Out (Let It All Hang Out)" -- for an unlisted bonus track. Still, when he does hit his target, like on the gentle "Jackie Brown," the stuttering, fiddle-driven "Sometimes a Great Notion," and even the self-pitying "Pop Singer," Mellencamp proves that his talents haven't abandoned him. The weary rock of Human Wheels was generally ignored, so John Mellencamp quickly banged out Dance Naked, a brief collection of by-the-book rockers. Since he and his band are professionals and fine craftsmen, it's an enjoyable record, but it has even fewer standout songs than the similar Whenever We Wanted. It's a problem that a cover of Van Morrison's "Wild Night," sung as a duet with Me'Shell NdegeOcello, is the best cut on the record, since that emphasizes how similar and undistinguished Mellencamp's songs sound.